Adam's Spinning Top is the second sculpture in the plaza, created from bronze with perforated text in English. 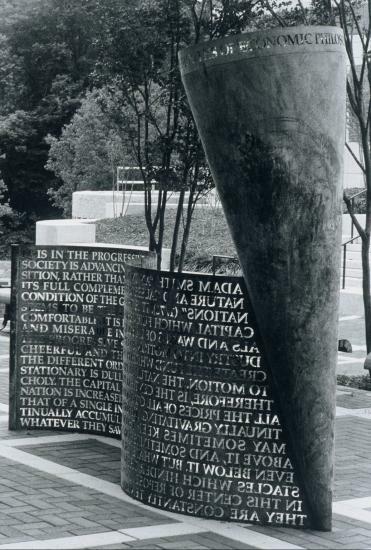 The artist chose text from the writings of Adam Smith, an economic theorist and John Maynard Keynes, a 20-century theorist for the sculpture. The artwork stands as a metaphor for the importance of a healthy economy and an invigorated mind. 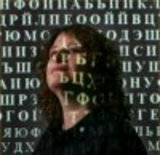 During the current economic crisis, I am often reminded of some of the other sculptures by James Sanborn (Kryptos creator), such as the multiple sculptures entitled "Adam Smith's Spinning Top". I see the economy spinning and moving along. The faster the movement, the more stable the top, and the stronger the economy. The movement is caused by everyone: Businesses, banks, government, individuals buying and selling. With the economy moving along at a good clip, everyone buying and selling, things are good. But right now, people are hunkering down, and not buying and selling. People are scared, are more likely to save than spend, and the top is slowing down more and more. Which affects everyone, as the economy weakens. The money to get it moving again is there, but people are reluctant to help push it along, because they're more concerned for their own finances, which, ironically, makes their own finances worse. Ideas are needed to get the top moving again, and spinning at a healthy rate. Which means people need to be confident enough to spend some money. For each dollar spent, that dollar keeps moving, and affects multiple other people. I may go to a restaurant and enjoy a nice meal of sushi. The money I spend goes to the waitress, and the restaurant owner. They send the money along to their food suppliers. The waitress spends the money on clothes for her kids. The food suppliers spend the money going to a movie. The theater pays salaries to its own employees. Those employees may logon to the internet to play a subscription game, and that money comes back to me, so I can keep going out to sushi. ;) But the money's gotta flow, or everyone suffers. 2. Occur because of the IRA owner's death. 3. Are a series of "substantially equal periodic payments" made over the life expectancy of the IRA owner. 4. Are used to pay for unreimbursed medical expenses that exceed 7 1/2% of adjusted gross income (AGI). 5. Are used to pay medical insurance premiums after the IRA owner has received unemployment compensation for more than 12 weeks. 6. Are used to pay the costs of a first-time home purchase (subject to a lifetime limit of $10,000). 7. Are used to pay for the qualified expenses of higher education for the IRA owner and/or eligible family members. 8. Are used to pay back taxes because of an Internal Revenue Service levy placed against the IRA. However, with the economy worsening, these exceptions should probably be expanded. There are plenty of people with substantial funds in their IRAs right now, but they're reluctant to touch the money because of the withdrawal penalties. However, if the penalties were temporarily waived, people could be more comfortable about accessing the cash, spending would increase, and it would help get "Adam Smith's spinning top" of the economy moving again. At least in the United States, laid off workers have social services and safety nets. Unemployment insurance, COBRA to continue medical benefits, etc. In other countries, things are much much worse. This is destined to be one of the classic SNL skits. Brilliant satire about playing the Nintendo Wii. ZOMG! The Zombie Apocalypse is Nigh! Okay, yeah, it's an ad video about "Every man's fear".